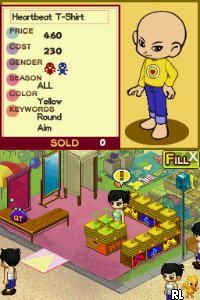 OverviewBuild a fashion empire in this kids' game from Koei. 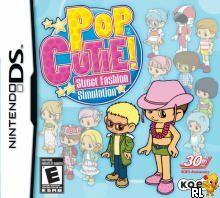 Pop Cutie: Street Fashion Simulator is an awesome game, but explaining why is a bit difficult. It is one-part shop-sim, one-part insanity, one-part hilarity, and one-part solid gameplay. This game is very unique in both the characters it features and the way you go about marketing items, creating new ones, and interacting with the world around you. You can hire shop attendants to care for your customers while you're out and about, you can design new fashions, you can chat up Mephistopholes while he comes to screw with the people in your shop. You get all kinds of crazy visitors while you're in your shop. Cordy Nate might come by to dress a random customer in your clothes, forcing them to buy everything they are wearing; the mail-robot might come by and drop off an invitation to a fashion battle, or something else kooky could happen. Out on the streets you can pick flowers to add to your humoungous color pallete, see what the word on the street is about new fashions, who's popular, and general trivia, and you can see how your rivals are doing. The amount of activity packed into this stylishly-animated, wonderfully fun game is staggering. If you want to laugh, try out this game. If you want a new sim, try out this game. If you're just looking for something weird, try out this game, because Pop Cutie is amazing. Now you can add videos, screenshots, or other images (cover scans, disc scans, etc.) for Pop Cutie! - Street Fashion Simulation (U)(Diplodocus) to Emuparadise. Do it now!